I�ve always loved the excitement that is created by fire engines - the sirens, the flashing lights, and the bells have always been a thrill for me! And, I love old vehicles. Now, I have the opportunity, through Smokin' Joe's, to bring my two passions together. My hope is that vintage fire apparatus of all types might live on, so that I can provide enjoyment and education for both children and adults alike. 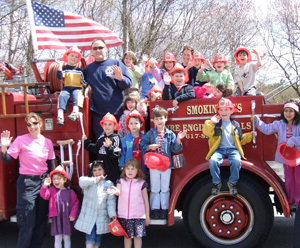 Joe�s commitment to safety, education and fun is the foundation of Smokin' Joe's. As satisfied customers - from school administrators, to parents, to business owners alike - can attest, Joe and his team infuse every event with professionalism and amusement, and that�s why everyone LOVES the experience! Don�t miss out on the opportunity to take your next special event to a whole new level. Contact Smokin' Joe today!